If you want to play slots online then this a great game to try. This online 5 reel is fresh out of the Moulin Rouge with its seductive and mysterious prizes and bonuses that are on offer. With a classical soundtrack and Can Can dancer graphics this online slot game is a perfect escape if you’re wanting a Parisian rendezvous or even a high-energy game to whet your appetite. View online slots at this link for details about the game. In 1997, Eyecon was founded and since then online casino gaming has never been the same. This leading games developer has set the industry standard for online casino games. Their spin slot games and scratch cards are filled with the highest-grade graphics, stunning animations and effortless gameplay. Fancy a night out on the town? Inspired by the French dance typically seen in cabarets, this online slot game will indulge you in the delights and splendour of Parisian theatre. Just like you would if you were in the theatre, in Can Can you’ll see a line of beautiful jiving dancers kicking and prancing their legs high in the air, and delivering all the iconic dance moves that you’d expect. This online slot game is set on 3 reels with 5 playlines. The game has a total of 100 win lines and you can play for 60, 120, 180, 240 and 300 credits. It provides lots of opportunities for players, making it considered to be the best UK online slots in the future. As you would expect, the dancer is the Wild symbol in this game. She comes with a magnificent red headdress and this will substitute for every other symbol on the reels aside from the Scatter. Due to the Wild Reel feature, all other symbols directly above and below will also turn wild. This symbol also activates the Reel Growth feature. The Wild symbol is 4 high and if it appears on 1 or more of the top symbols on a reel the entire slot will expend upwards opening up an additional row. Each of these new rows offers an extra 50 win lines. This Wild symbol is also joined by the Can Can symbol, both are jointly the highest paying at the game worth 100 extra coins for the maximum 5 in a row. Three other Can Can girls, backed by purple, blue and green are all worth 50 coins for five, while other symbols such as a white cat, a pocket watch and champagne are joined by the playing cards A, K, Q and J in completing the standard symbols. In this online slot game, the Scatter is the Love Heart symbol and this will trigger the Love Wheel bonus feature when it appears on 3 or more reels. It also pays out an immediate scatter win. This scatter comes with a range of multipliers of x2, x3, x4, x6 and x10, which one you’ll get is randomly selected before each spin. The Love Wheel is a tombola wheel game where you’ll find a combination of cash credits, free spins and 1 of 4 progressive jackpots. 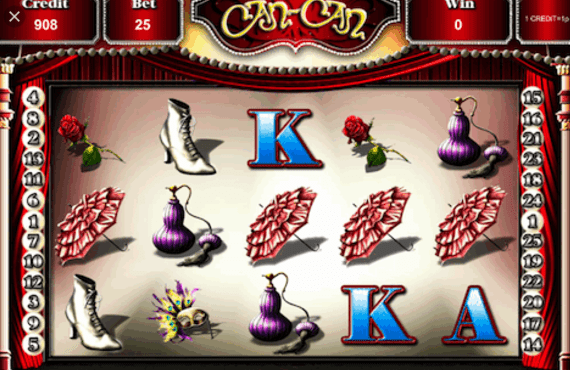 If you land the free games, you’ll also play these with the Can Can symbol as the Wild, while these can be retriggered by landing 3 scatters, awarding you 8 free spins. 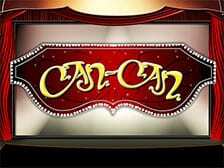 The Can Can online slot game will certainly catch your eye, the game is completely lit up by the dancing girls on the reels and all of the symbols are very colourful, standing out against the dark backdrop of the reels. This original theme accompanied by an excellent gaming experience and lots of bonus features makes it a game that you’ll be drawn to again and again. Another mental game to try is Twin Spin.